Sydney - South Africa have turned to a grizzled adventurer, who has explored the Amazon and trekked to the North Pole, to help them navigate their path to a maiden Cricket World Cup. 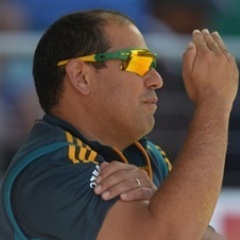 Coach Russell Domingo drafted in South Africa-born adventurer Mike Horn, whose feats of endurance include reaching the North Pole without the aid of dogs to carry sleds and swimming the Amazon River on a riverboard, to help put Wednesday's quarter-final against Sri Lanka in perspective. Horn has plenty of experience working with sports teams, having been invited by then India coach Gary Kirsten to speak to the squad during their victorious 2011 World Cup campaign. He previously worked with the Proteas when they took the world number one Test ranking off England in 2012 and advised the Germany team before they won football's World Cup in Brazil last year. "He's done a lot scarier things in the world than facing Dale Steyn or Morne Morkel, he's done some extreme things," said Domingo of Horn ahead of Wednesday's match at the Sydney Cricket Ground. "He will put it all into perspective for us about what pressure and fear's like and being out of your comfort zone, because he's been in that situation a lot of times with real-life experiences, not just facing a cricket ball." South Africa captain AB de Villiers added: "He (Horn) brings great energy to the team. He'll have a bit of a chat to us. He had a chat to the Germans who won the World Cup not long ago, things that worked for them. We can maybe a learn a little bit from that." But de Villiers insisted Horn's involvement was not a sign the Proteas lacked a winning mentality. "I really believe that myself and a few of the senior players know how to play these kind of games in the pressure situations," he said. "We've done it before, and there's no reason why we can't do it tomorrow, and it's a matter for the rest of them to follow." Horn, explaining his philosophy, recently told a South African radio station: "I don't lose a match, I lose a life and my commitment is completely different. I don't just play, I play to win, I have to win. "If you have that mindset where losing is no longer an option and the whole team believes in it and you can create the team that helps each other to move forward and everybody is willing to give more than what's asked for, then you can create a dynamic that the Germans have," he added.